Embarrassingly I am a fan who grew up after the Roman Gabriel era, and my memories of him is neither as quarterback of the Los Angeles Rams or Philadelphia Eagles, but rather as head coach of the woeful Raleigh-Durham Skyhawks from the WLAF circa 1991. These were the only cards I had in my collection of him, and after being informed of his stiff signing fee of $10 per signature, I waited sometime before contacting him a second time for an autograph. 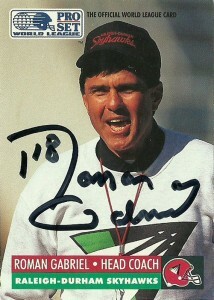 He kindly enclosed an Upper Deck legends card from 2005 as well, and thanked me for writing. 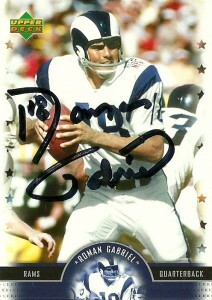 An all-around athlete for NC State, Roman Gabriel was drafted by the Los Angeles Rams in 1962 as the second overall pick. (He was also chosen in the AFL draft by the Oakland Raiders.) Choosing to sign with the Rams, Gabriel would go on to become perhaps the most successful Asian-American in American Football, rewriting many of the passing records for the Rams franchise (later rewritten by Jim Everett), once he was made the starting quarterback in 1966. After flirting with the AFL and signing with the Raiders, Roman would stay put with the signing of head coach George Allen. His patience would be rewarded, as Gabriel would be named the NFL’s MVP in 1969. As knee and shoulder injuries began to take their toll on Gabriel, he’d be traded to the Philadelphia Eagles in 1973 and help right the ship of the woeful Eagles franchise. He’d be named comeback player of the year in 1973. Over the last few seasons he’d play sparingly as a backup quarterback until his retirement after the 1977 season. Gabriel’s strongest attributes were his powerful arm, his excellent decision making abilities, and he’d finish his career with an 84-67-7 record. Roman has remained active in the sports arena after retirement and dabbled in acting. Besides owning some car dealerships, he worked as a color commentator and served as a head coach. 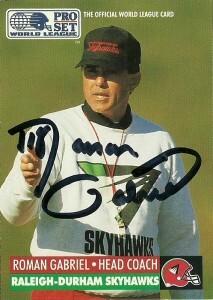 In this capacity among his notable stops were that Gabriel was head coach at Cal Poly Ponoma, offensive coordinator of the USFL Boston Breakers in 1983, quarterbacks coach of the Arizona Wranglers in 1984, and finally at his gruesome stop as first- general manager and then finally as head coach of the WLAF Raleigh-Durham Skyhawks. Unfortunately things didn’t work out for Gabriel the way he had hoped as the Skyhawks finished 0-10 in their only season in the league. Since that time he has diversified his interests and is deeply committed to charitable work. He was inducted into the College Football Hall of Fame in 1989.